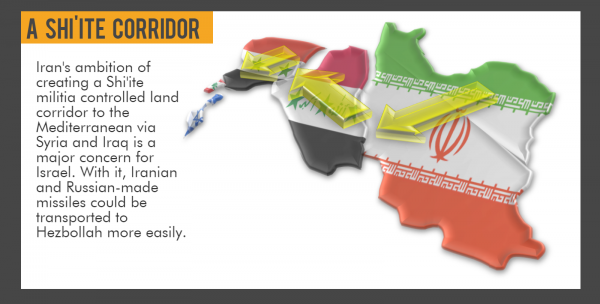 The BICOM research team has produced a new Strategic Assessment analysing Hezbollah’s hold on Lebanon and its implications on a future war with Israel. 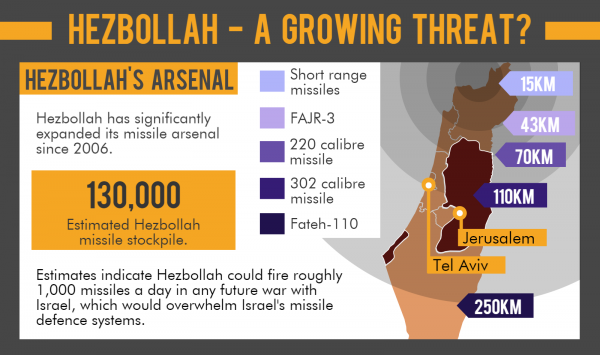 Buoyed by an influx of weaponry manufactured in Iran and Russia, Hezbollah now possess an estimated 130,000 missiles and is capable of firing 1,000 a day into Israel, overwhelming Israel’s most advanced missile defences. Israeli security experts are now concerned about the growing closeness of the terror group and the Lebanese state, including the army. In the event of a war Israel now says it would not differentiate between the Lebanese government and Hezbollah as it has done previously. The paper also outlines the challenges for the UK and the international community posed by Hezbollah’s growing strength in Lebanon, with the UN Security Council set to hold consultations about alleged violations of the resolution by both Hezbollah and Israel later today (Thursday 20 July). 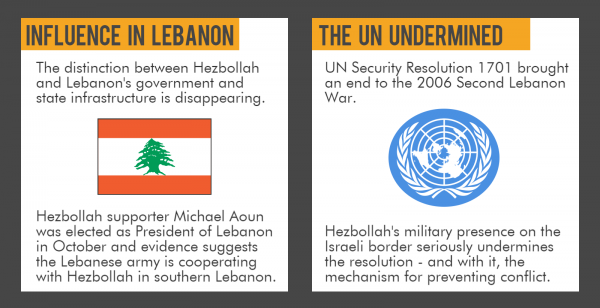 Lebanon’s new president, Michel Aoun, has publicly confirmed that Hezbollah plays “a complementary role to the Lebanese army,” an admission that constitutes a direct violation of United Nations Security Council Resolution 1701. Hezbollah continues to fight in the Syrian civil war on behalf of Bashar al-Assad and increase its missile capacity. It also uses aggressive rhetoric against Israel to try and shore up its domestic legitimacy. Members of Israel’s security establishment currently believe that in the event of a third Lebanon war, the Lebanese army will participate either alongside Hezbollah, or at the very least in a supportive capacity. As a result, Israel’s emerging strategy entails widening its targets to include attacks on Lebanese infrastructure. Publicising this strategy now is intended to deter Hezbollah from attacking Israel, and to encourage the Lebanese government and others in the international community to rein in Hezbollah’s activities with respect to Israel. Neither Israel nor Hezbollah are seeking to end the state of mutual deterrence that has characterised their relationship since August 2006, though the potential exists for miscalculation by either side that drags the parties into another war.